Tonight, I read an adorable new children's book with my daughter. It's My Yellow Umbrella by Chris Robertson, a whimsical story featuring a little girl who holds her yellow umbrella with her everywhere she goes. And that umbrella takes her to some amazing places. She flies over a chocolate factory and floats on a river. Her umbrella opens up a world of dreams for her. One of my favorite pages shows the little girl lounging by a river, and she says, "My yellow umbrella is warm like the summer sun. Cozy like an afternoon nap. And happy like a picnic in the park." It's a fun, positive story that is accompanied by beautiful illustrations that really highlight the star of the story: the yellow umbrella. M said she really liked it because her favorite color is yellow, and she liked how the girl was very imaginative. 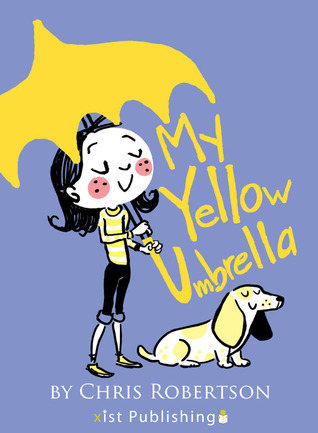 If you're looking for a new picture book to share with your kids, definitely check out My Yellow Umbrella. This review was written based on a copy of My Yellow Umbrella that I received from the author in exchange for an honest review.